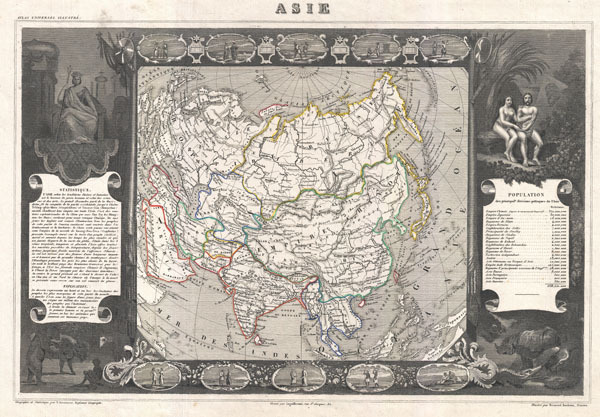 A visually stunning decorative map of Asia dating to 1852, by French map publisher Victor Levasseur. Covers the entire continent of Asia as well as parts adjacent parts Europe and Africa. Shows the Chinese Empire including Tibet and Mongolia. In Southeast Asia the Kingdoms of Annam, Chochine, Tonkin, Siam, and Burma are noted. Singapore is identified. Afghanistan is divided into the Kingdom of Kaboul, the Kingdom of Heral, and the Confederation of Belouchistan. Several islands in the Russian Arctic, including Nova Zembla and the New Siberia Islands are mapped vaguely. Curiously, Levasseur identifies one of the Japanese Kuril Islands as the land of 'Compagnie,' a semi-mythical island sought by many early explorers of this region including Behring and Cook. By far this map's most striking feature is its elaborate allegorical border work. Levasseur composed this map for publication in his magnificent Atlas Nacionale de la France Illustree, one of the most decorative and beautifully produced atlases to appear in the 19th century. This particular map is surrounded on all sides with elaborate allegorical border work. Surrounding the map are ten medallions intended to represent life in Asia - though most of the these seem to focus on India, at the time the most known of Asian lands. To the left of the map proper is an enthroned woman, a most likely representation of Hesione, the wife of Prometheus, who is commonly associated with Asia. Curiously the figure holds a main de justice, a kind of scepter with a hand of benediction on top, it her right hand. The main de justice was initially a symbol of royal French power and in this case is a possible reference to the French claims to Indochina. Right of the map Adam and Eve are drawn relaxing in Eden, with a benevolent God figure looking on. As with most Levasseur depictions of god, his halo is pyramidal, a possibly Masonic reference. Levassuer's choice to add Adam and Eve to this map is a reference to mediaeval beliefs that Eden lay in the seas beyond Asia. Various exotic animals including a bear, a buffalo, an rhino, a tiger, and an crocodile appear at the bottom of the map. Rumsey 0427.097. Phillips (Atlases) 3003.